Spending time with Martha's older books is a pleasure I try to indulge in at least once a month. I'm not one to let books sit around collecting dust. I read them - sporadically - and always leave several pages unturned so that I have something to look forward to the next time. 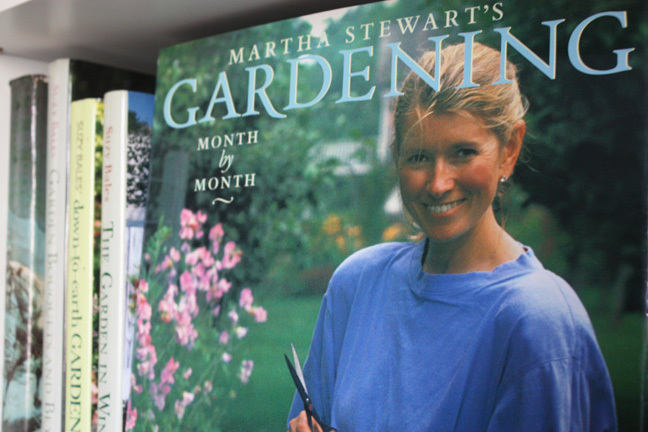 Martha Stewart's Gardening Month By Month (1991 Clarkson Potter) was Martha's eighth book and is my second-favourite, after Entertaining. At the time of the book's release Martha was already a bestselling author, a well-known spokesperson and consultant for Kmart and a columnist in national newspapers and magazines. She was considered to be the leading lifestyle expert in America, with stints on David Letterman and Oprah, and special holiday programs on television. She was on the cusp of releasing the first issue of her magazine, Martha Stewart Living, and launching her weekly TV series of the same name. Yes, 1991 was a big year for Martha! 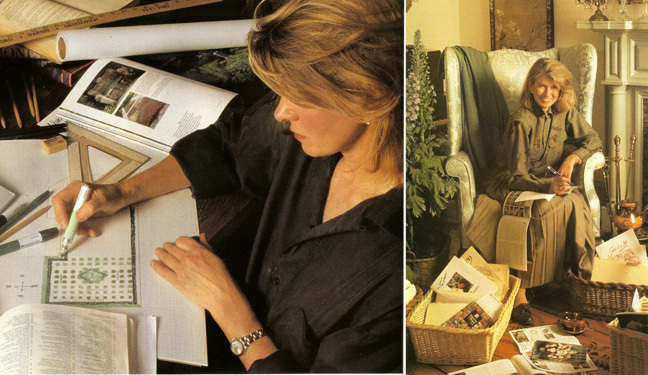 I was in elementary school at the time of the book's release and the name Martha Stewart was still unknown to me. I purchased this book nearly a decade later and it instantly captivated me, reminding me of the gardens at my grandparents' house and the gardens I helped plan with my dad, sitting with him at the kitchen table imagining which plants would go where. 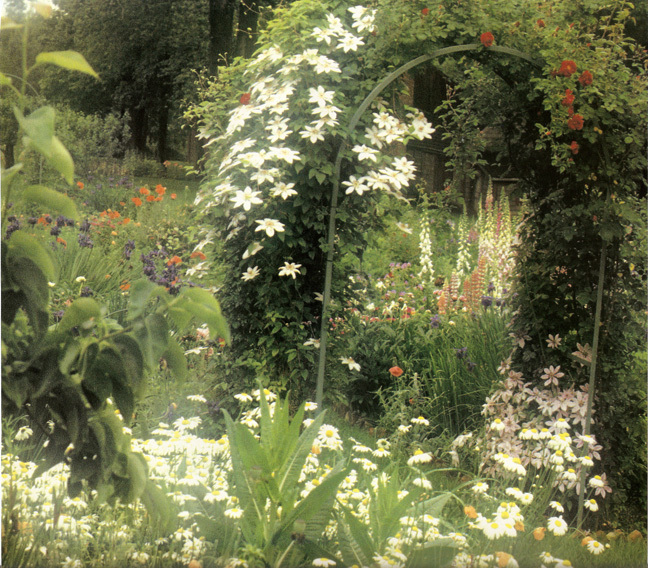 It was the book's personal vision that I found so engaging, calling to mind nearly all of the gardens I had loved as a child, even if they were not as large or ambitious as Martha's. They still held so much wonder, then and now in memory, just as Martha's Turkey Hill gardens did for me when I first laid eyes on this book. Gardening Month by Month is the quintessential Martha Stewart book: a large, coffee-table sized format with full-colour imagery of the grounds at Turkey Hill. There are recipes and illustrated instructions, as well as informative how-tos that are humanized by Martha's personal garden journal entries. Already, Martha's lifestyle concept of incorporating several areas of content (cooking, decorating, gardening, crafting) into one beautifully-written, gorgeously-illustrated volume was apparent. The concept would prove to be the foundation for Martha Stewart Living magazine upon its release and Martha's eponymous company, by extention. Upon opening the book, the reader is greeted by this highly-detailed illustration of the grounds at Turkey Hill (above), showing all the various areas of the yard. This is only one section of the drawing, but it reveals quite a bit about the size and layout of the place. The book is divided by month, as the title suggests, with seasonal tips, recipes and instructions for the garden as it evolves throughout the year. There is information for growing specific vegetables and flowers, making flower arrangements and caring for houseplants. Its real strength, however, is the overall picture it presents of a successful garden that has been tended to and carefully planned, revealing hard-won victories that Martha's determination made possible. Whether she intended this or not, the book reveals a great deal about Martha's personal tastes and her formidable character. It is a wonderful book - one I cherish in my collection - and if you do not have it yet, I urge you to get it. These are two of my favourite photos of Martha in the book: on the left is Martha dripping with sweat and caked in dirt as the sun sets at Turkey Hill after a long day outdoors. You can almost hear her sighing. I think the photo goes a long way in quashing the impression many people had of Martha as someone who doesn't like to get her hands dirty. 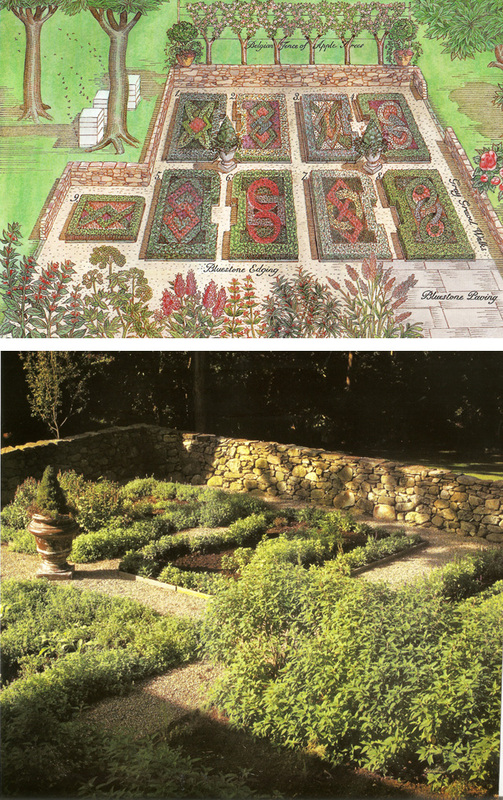 These gardens are her gardens and her personal work was instrumental in their keeping, year after year. 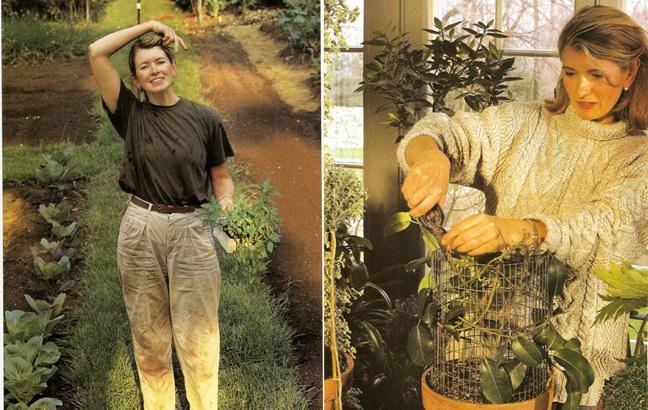 On the right, Martha is on the sun porch, pruning some of her houseplants. In the book, she reveals that she has rarely had luck with typical houseplants but finds them irresistible. I enjoy the expression of uncertainty on her face as she leans back before making that fateful snip with her shears! View of an arbour leading to the shade garden at Turkey Hill. 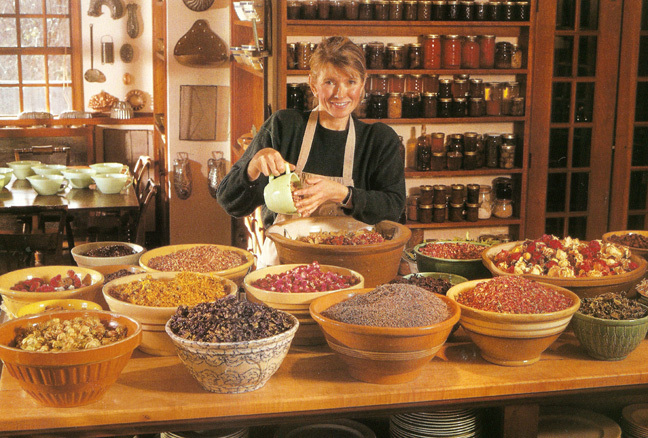 The dead of winter is the perfect time to plan and prepare for spring planting: Martha planning her formal herb garden, left, and ordering seeds and bulbs from her favourite catalogs, right. 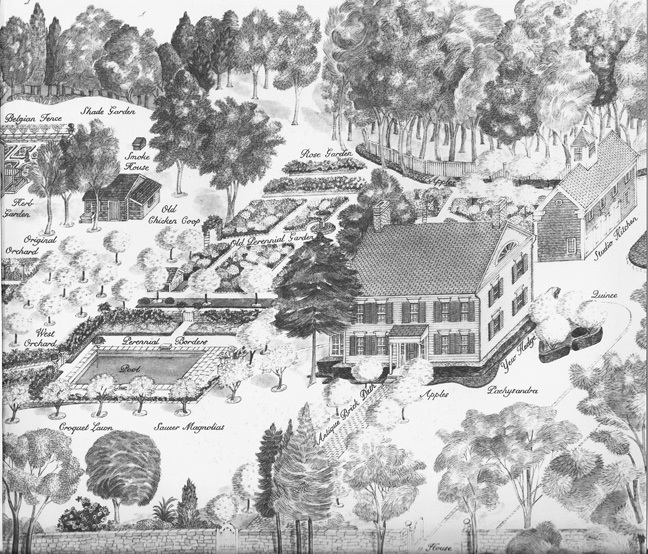 The plans for Martha's formal herb garden at Turkey Hill were extremely elaborate, as you can see in the illlustration above. The finished product was a rustic variation on the sketch, but no less prolific. In the book, Martha shows how the wall was built and how her herb plantings were planned. 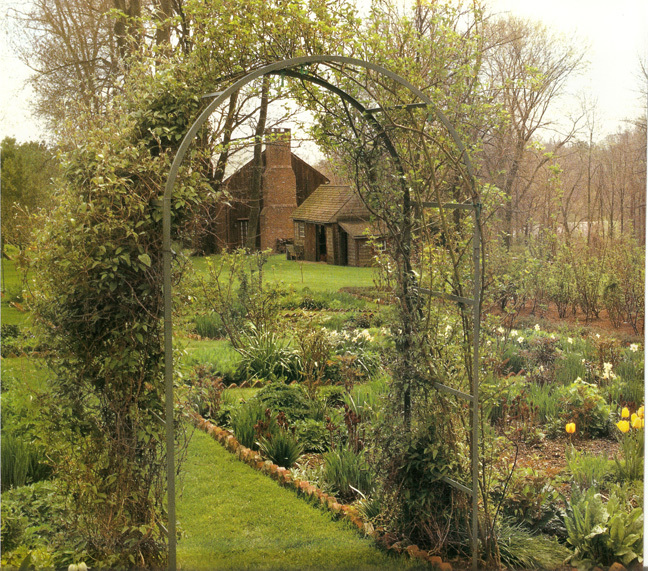 This arbour leads wanderers to the 'barn' shown in the background near the potting shed. It was an old structure at the back of the property that Martha used for entertaining and restoring large pieces of furniture. A second laneway led from Turkey Hill Road to this location, which is where the herb garden was planted on the opposite side. 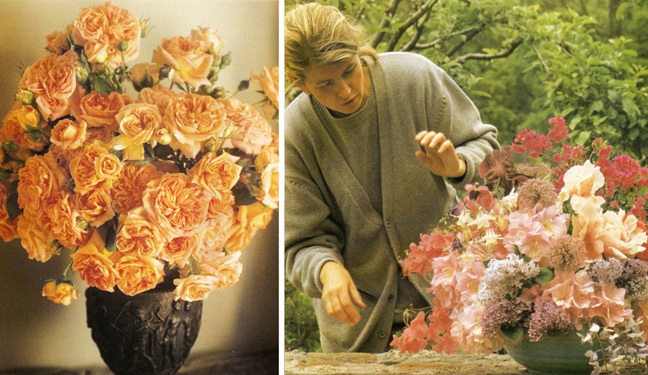 Martha's excellent flower-arranging skills are shown to great effect throughout the book in numerous examples. 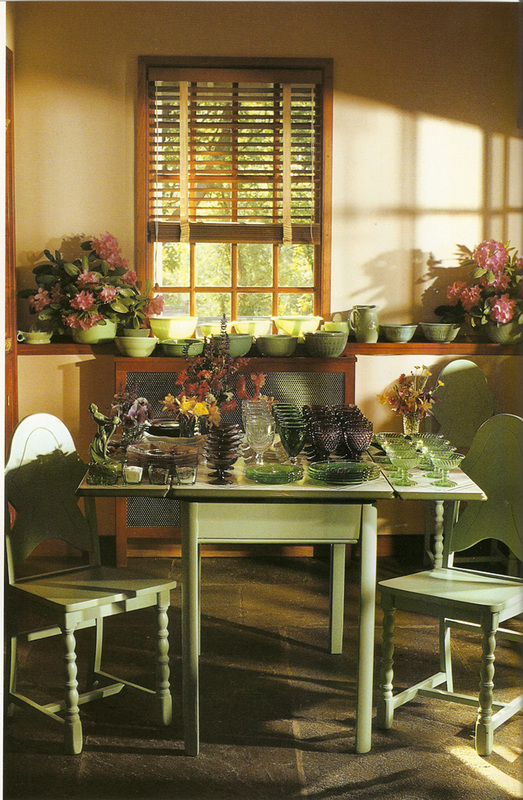 A restored kitchen dining set painted Martha's favourite colour in the studio kitchen, which was located in a separate building from the main house. This space was Martha's catering 'home base' for many years. 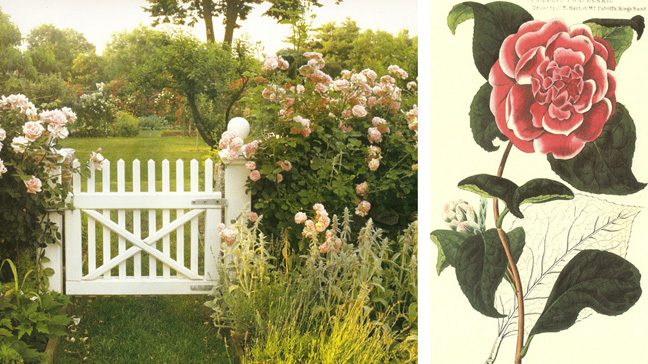 Peonies and a white picket gateway leading to the orchard, left. Throughout the book are botanical illustrations from the 1800s by English artist J.T. Hart. These drawings were later developed by Martha into a collection of writing papers and stationery designed by Robert Valentine Inc.
Martha in the studio kitchen readying the dried floral ingredients for large batches of her handmade potpourri, which was given to guests, hostesses and friends at Christmas in beautiful packages. I too love to browse this book. I've never ever had space (or time) for a garden but I've loved this book nonetheless. One of my favorite pictures ever is the green table with the depression glass - Martha inspired my depression glass collection - no mean feat in Alaska. I've never had my own garden either, Vicki. But I grew up with gardens and I've been in love with them ever since. This book is a treasure. This is my favourite of Martha's books. I look at it every month to see what I should be doing, but the thing I love the best along with the beautiful photos is the fact that it states what didn't work. I love that! When I was 13 I borrowed this book from our public library so many times! My mom finally bought me a copy for a present by age 16. Its my FAVORITE of the early Martha books. I would stare at page 60 for hours. And still search for a jadite cake pedestal like the one on page 39. It can also be seen in the November 1995 issue of MSL. It is on the huge island at Lily Pond lanes kitchen in the home office article,Its holding custard cups filled probably with fresh ground pepper and different types of salts. The books end papers were the closing images of her first season of MSL. It would always land on her house at the end of credits! I love this book. With the internet and Millions of gardening books out there this still is the only cure for winter blues. In bleak January this is like a burst of hope for the coming season! This is an amazing book I love it. One of my favorite wedding gifts that I treasured was Martha's book Hors d'Oeuvres, it is how I entered the world of Martha Stewart and since then she is an inspiration. So true! She's admitted to doing Botox, but beyond that it's all natural! She has amazing genes.